Lots of poker players enjoy sit and go’s because they’re quick, relatively cheap and exciting. And William Hill Poker is adding yet another reason for players to enjoy these single-table tournaments by offering Progressive Jackpot SNG’s. There are four types of these SNG’s in Fort Knox, Rio, Maui and Dirty Dozen. Each one offers a different starting jackpot size and buy-in, and entry fees remain the same no matter how large a jackpot gets. At the time of this writing, the four progressive prizes total $194,500! 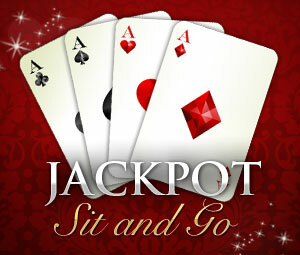 As for unlocking the jackpots, you need to win a designated number of SNG’s in a row. Assuming you can accomplish this feat, you not only get the winnings for the tournaments, but also the available progressive jackpot. With the basics out of the way, let’s take a closer look at each of the Jackpot SNG’s. Requirements for winning: Players must win six straight Fort Knox SNG’s to capture a prize worth at least $50k. Anybody who manages to finish 1st or 2nd in six straight tourneys will earn a $750 consolation prize. Requirements for winning: Anybody who can win six straight Rio SNG’s will collect a jackpot worth at least $30k. If a player is able to finish 1st or 2nd in six consecutive Rio tournaments, they’ll get a $300 payout. Requirements for winning: These are 10-seater tourneys, but players only have to win five consecutive Maui SNG’s to capture a jackpot of $15k or more. Players can also win $200 cash by finishing 1st or 2nd in five straight Maui tournaments. Requirements for winning: These are the biggest tournaments since 12 players take the felt. However, one only needs to win four straight Dirty Dozen SNG’s to unlock the $2k jackpot. With several different jackpot opportunities available, it’s definitely worth signing up for William Hill Poker rakeback at RakeTheRake and trying to win big!